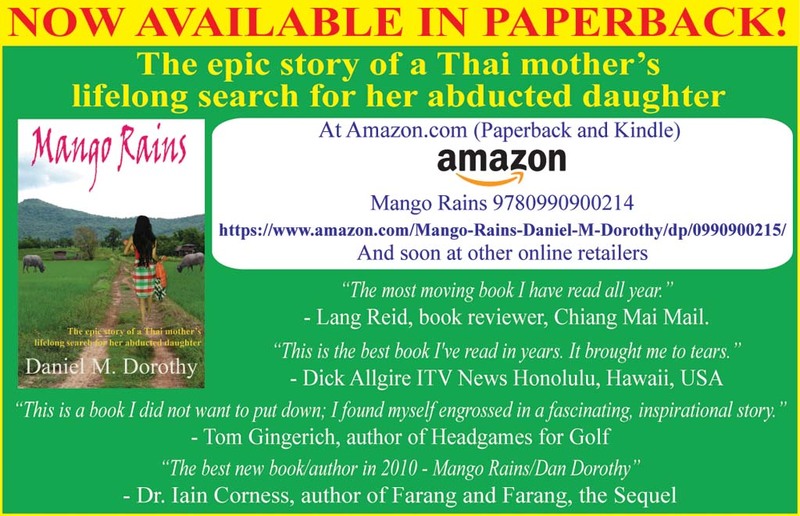 Inspired by actual events, Mango Rains is the incredible story of a woman who overcame insurmountable odds while searching for her abducted child. She devoted her life to the impossible task of navigating through a web of deceit, exploitation, and the criminal underworld to drag herself out of obscene circumstances into a better life, and to use her status, and incredible luck, to eventually realize her dreams. This, paralleled with the story of her abducted daughter who was forced to endure heartbreaking tragedies, and experience occasional triumph, often bittersweet, whilst finding her way alone through a similar web of deceit, exploitation, and the criminal underworld, giving the reader an unparalleled look at the hidden world where children disappear without a trace in Asia. At times this book will bring you to tears, both tears of tragedy and tears of triumph. This is a story of love and inspiration, a story of how a mother never gave up hope of finding the daughter she lost. Lek waited for what seemed like an eternity for the woman to stop pounding on her door. Several times she nearly gave in to the temptation to find out who it was, but was able to restrain herself. Finally the pounding stopped and for the next few minutes there was a deafening silence. The stranger was obviously listening for movement. Lek remained frozen to her bed, listening intently to any signs that the stranger was still waiting outside her room. The silent standoff lasted another few minutes before Lek heard the distinct sound of footsteps walking away from her room. It was so quiet that Lek thought she could hear the footsteps all the way down the three flights of stairs and out into the parking lot. Still, she didn’t dare move. What if there was someone else outside the door, waiting for her? That was a chance she’d have to take. She couldn’t stay hidden in her room all day. Soonton was waiting for her in the cafe downstairs and if there was someone waiting for her outside, she figured at worst she could make it that far. Soonton would know what to do. Examining every corner along the way, Lek stealthily made her way over to the cafe. “Where have you been? Do you realize how dangerous it is for us to be here?” Soonton snapped. “Who was it?” The tone of Soonton’s voice changed from anger to worry. “I don’t know. I didn’t open the door. I think it was a woman but I didn’t recognize her voice,” said Lek. Soonton rose from the table and made his way toward the exit. Stopping to survey the parking lot, he waved Lek over to join him. Seeing nothing threatening, he led Lek across the parking lot toward a car he had parked near the exit. Lek snuck a glance into the office on her way by. Prasit was busy talking with a woman inside. Was that the woman who knocked on her door? Lek didn’t recognize her. Both she and Prasit looked over toward the cafe at the same time. The early afternoon sun brightly lit the inside of the cafe allowing the two observers a clear view. A few customers were scattered about, quietly eating and talking amongst themselves. Not one of them even vaguely resembled Lek. “Where?” Nid yelled, quickly spinning around to see what Prasit was talking about. “There, across the parking lot.” Prasit pointed toward Lek and Soonton. They appeared to be trying to make it across the lot unnoticed. “That must be the woman who knocked on my door!” Lek said, panicking. “Let’s go! Quick.” Soonton grabbed her and pushed her into the car in front of him. The keys were already in the ignition and it only took a split second for the engine to come to life. “Lek! Wait! I’m your mother! Come back!” Nid screamed. “What is she saying?” Lek asked Soonton. “I don’t know and I don’t care,” Soonton replied as he floored the accelerator. The tires spun as the car lurched out of the parking lot and into the street. “Lek! Wait!” Nid continued to scream as she ran after them. The car was too fast, Nid didn’t have a chance. Out of breath, Nid leaned on a light pole and watched as her daughter rounded a corner and disappeared from sight. Nid didn’t even notice the two police cars that pulled into the parking lot behind her, but she sure noticed them as they screeched out of the parking lot to give chase to Soonton and Lek. Nid did as instructed and tried to understand the muffled words that came through the radio. Prasit seemed to know exactly what they were talking about and deftly steered the car down side streets and toward the west end of town. “They’re going to try and head them off before they get into the countryside where there are hundreds of little dirt roads they could use to escape,” he translated. Escape. The thought sent chills down Nid’s back. She’d never been this close, ever. She secretly hoped they could avoid the police, yet somehow get hung up so that Nid could get to them first. Why was Lek running? “Finally, we’re creating some separation,” Soonton said after sustaining ludicrously high speeds through city streets, busting through intersections, narrowly missing pedestrians and other vehicles. Now out of the city limits and onto open road, the old car was being pushed to its limits. Here’s our chance, he thought. The police are still trying to navigate the city streets and will be held back by any carnage we caused getting to open road. Aaaah! He used a little too much speed on a tight corner. When the wheels were no longer able to maintain their grip, the car began to slide sideways. Trying to regain control, he turned too hard on the steering wheel, and shot across the road to other side. Another correction put him back onto the pavement, but by now all hopes of controlling the uncontrollable sent the car careening sideways into the ditch. With a horrifying thump, the car hit a large boulder, sending Soonton head first into the windshield, killing him instantly and sending the car flipping into the air. The centrifugal force pushing Lek against the passenger door was too much for the latch. When it gave way, Lek was flung out, cart-wheeling through the air, landing in thick underbrush. When the car bounced off the ground and made another terrifying revolution in the air, the passenger door broke loose completely, sending it flying into the tapioca field on the other side of the road, 50 meters away. The sickening sound of metal, glass, tarmac and gravel mashing together lasted only a few seconds, but seemed to last forever. Then there was silence.